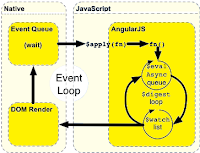 The angularjs $rootScope is the scope and one application can have only one $rootScope and It use like global variable and access in across application. The angular $rootScope is parent scope and $scopes are child scopes. The $rootScope objects updates under a specific controller $scope not for all global controllers. The angular $scope can't be used outside the controller and its only for current controller but the $rootScope can be used anywhere and Its available globally in the application. All app has one-and-only $rootScope and its lifecycle is the same as the app and its all controllers can have. The $apply and $watch are scope methods. You can see the working life-cycle in below image. The Example in detail over $scope vs. $rootScope as given below.